Founded in Essen, Germany in 1955, these Awards honor the greatest achievements in industrial design every year, based on criteria such as functionality, esthetics and ecological sustainability. 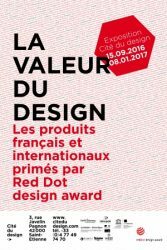 Several French companies including Airbus, Citroën, Ligne Roset and Renault have been awarded a Red Dot over the years. Ergonomics, a design criterion that improves the usability of a product. Life Sciences, which meets consumer demands for visually appealing, high-performance products.Modern Design, as design – when synonymous with innovation – is often a factor that triggers the decision to buy. Personal Mobility, which goes hand in hand with product mobility, for goods we can take anywhere. Smart Materials, which drive innovation in the design and engineering of products. Smart Technologies, which are today inseparably linked with design. The Cité du Design de Saint-Etienne is sponsored by the City of Saint-Étienne, Saint-Étienne Métropole, the Auvergne – Rhône-Alpes Region and the French State (Ministry of Culture). It is a platform for higher education, research, economic development and promotion of design and the arts. One of the Cité’s key missions is to raise awareness of design among a wide variety of audiences, from professionals and public-sector stakeholders to universities, the general public and more.